Three-room apartment " Sumy (Sobornaya street) " is located in the center of Sumy. The apartment has everything you need for a comfortable stay: alarm system, air conditioning, plasma TV, DVD, double bed with orthopedic mattress, two folding sofa, telephone, washing machine, iron and ironing board, computer, hair dryer, kitchen and bedding. It offers cable internet and Wi-Fi. There is a fully equipped kitchen, where you can prepare your own homemade food. Many shops, cafes and restaurants are located next to the apartment. Distance from the railway station is 3.5 km, bus station - 3 km. 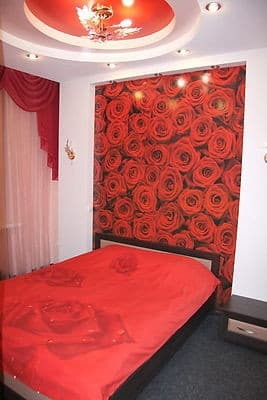 Three-room apartment " Sumy (Sobornaya street) " is located in the center of Sumy. Distance from the railway station is 3.5 km, bus station - 3 km. You can reach the apartment from the central train station by shuttle bus №13, №15. You can reach the apartment from the central bus station by shuttle bus №21, №14.